Welcome to Reverb Experts: where we talk to enthusiasts, aficionados, and industry pros about their favorite gear. Today we're talking to Ron Rothman, proprietor of Rothman's Guitars and author of Harmony, The People's Guitar. Ron gives us some insight into the world of Harmony, which was at one point the largest manufacturer of stringed instruments in the world. Q: There are an incredible variety of different Harmony models out there. What accounts for the wide range of instruments they built? The Harmony guitar company was one of the largest manufactures of musical instruments. In their day, they made more guitars than all the other guitar makers combined. They supplied many of the big mail order catalogs through the years. Sears marketed many of the Harmony instruments under the Silvertone label, which were the same Harmony-made instruments except for the label. Those actually accounted for almost half of the instruments made. They made different models, for each style of guitar popular during their history. Q: What do you consider the most iconic or important Harmony models? Of the calls I've had, there are several that stick out in my mind as some of the most sought after Harmony guitars. The Harmony Caribbean or Colorama guitars are rare, but most don’t play that well. Great to look out, but if you are looking for a playable guitar, any of the electrics can still be a good value. One of the most coveted guitar and sought after by players and collectors alike is the 1955 Harmometal bound Espanada. When it comes to one of the more desirable instrument, the Harmony bass is still one of the more desirable “off brand” vintage bass guitars. The Harmony H22 Bass has been one of the more sought after instruments. I have been playing a H22 bass, both 2008 and vintage, they both bring a unique voicing that only come from a vintage Harmony. The Jumbo H1265/6 with it's torotoise headstock veneer and pickgaurds, is also known for it's majestic look. And the Sovereign from 1967/68 with the “Africa” tortoise pickguard is one of the most sought after acoustics. 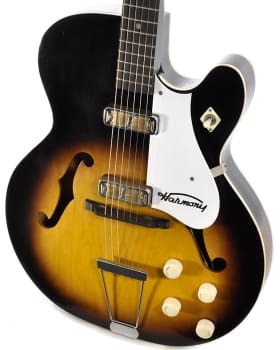 Really any top-of-the-line Harmony guitars are quite desirable. Q: What should buyers look for when shopping for Harmony instruments? Playability. Unless you want something to hang on the wall, if the guitar doesn't play well, that's all it is, a wall hanger. Q: How has general interest in Harmonies changed over the years? Many of the less expensive acoustics and archtops just don't play well and the cost of making them playable is not worth the investment. Most collectors are now searching out the top-of-the-line acoustics and electrics. They are being more selective in where their interest is, mainly looking for guitars that play. Q: What’s your personal favorite Harmony guitar? I have been performing with both H22 bass and Chris Isaak model (Silvetone 1446). Both offer a unique sound, with a vintage cool factor. One of the better sounding I owned was a 2001 Rocket (limited import by MBT). Some of the Korean imports are better made and better playing, and for that reason are more usable guitars. Q: What got you interested in the world of Harmony guitars? My experience with these guitars goes back to the early '60s. My first guitar (as with many guitar players) was a Harmony acoustic and learning to play guitar was inspired by one of these student instruments. The guitars in my store at that time were mostly Harmony made, and I would spend hours looking through Jobber catalogs at these guitars. Targ and Diner, Buegelson and Jacobson, and C. Bruno had pages of assorted Harmonys to look at. Through a series of articles in 20th Century Guitar magazine and my Guitar news, came my book. Q: Any other sources you can recommend for those looking for more info on Harmony?